In one of my previous posts, I shared with you How to buy Airtime from your UBA - United Bank for Africa Account. 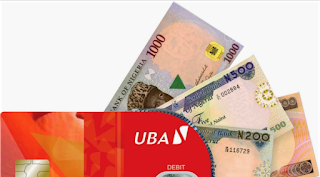 This time around, i want to show you how to recharge other mobile lines from your UBA account. This means that UBA allows you to recharge not only your own mobile line but also that of your friends and loved ones. This post will guide you on How to recharge other Mobile lines from your UBA account whether it is Glo, MTN, Airtel or Etisalat networks. To buy airtime from your UBA account to any Network, simply dial *919*mobile number*Amount#. For example, you should dial *919*08073087445*500# to buy 500 NGN airtime for the specified line. I hope this was helpful, Kindly share this post and let's have your contributions in the comments section below this page. Enjoy! It could be the network, try at a later time. i'm sure you have never heard of any platform that you can purchase airtime and Data on your phone in just 3 steps. www.VTpass.com has got your covered. You can Buy airtime, Data bundle with ease without leaving your comfort zone.